and information relevant for climate sciences posted by SISC members in the Association’s website. We invite you to submit the abstract of papers by June 15th, 2018. Submit your abstract here! 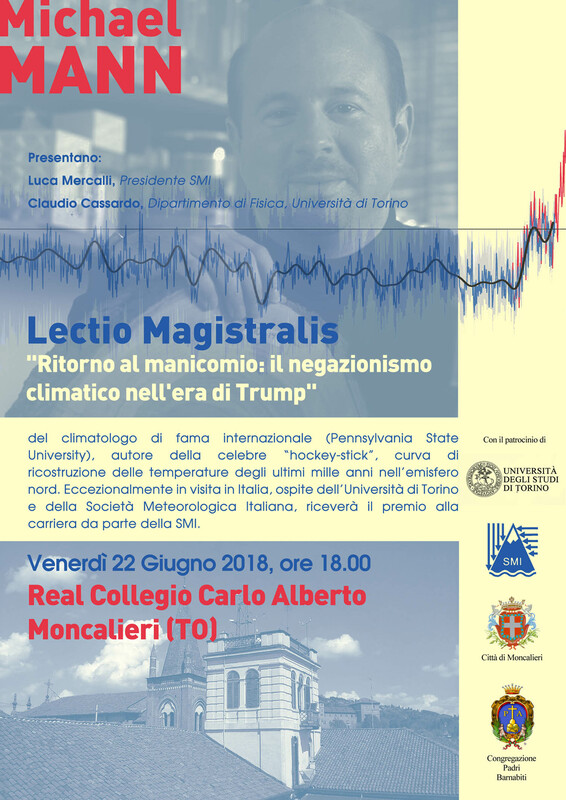 Michael Mann, Distinguished Professor of Atmospheric Science, Penn State and Director, Earth System Science Center, will held the lecture on “Return to the Madhouse: Climate Change Denial in the Age of Trump”on 20th June 2018 in Venice. On Tuesday, June 26th, 2018 at 12.00 pm Barbara Stenni, Associate professor of Geochemistry, Department of Environmental Sciences, Informatics and Statistics, Ca’ Foscari University of Venice will present “Antarctic climate variability over the last 2000 years”. The webinar is jointly organized by CMCC Foundation and the Italian Society for Climate Sciences (SISC). Further info on how to participate is available here. The video, presentation and readings on the CMCC-SISC Webinar held on March 21st, 2018, are now available at the webinar page in the SISC website. Slated to be held in Bangkok, Thailand, the conference will include sessions of the Subsidiary Body for Implementation (SBI), the Subsidiary Body for Scientific and Technological Advice (SBSTA) and the Ad Hoc Working Group on the Paris Agreement (APA). On 29 May 2018, it was announced that the dates for the meeting would be 4-9 September. Pre-sessional days are also anticipated. SISC members who would like to be nominated for attendance are kindly requested to contact the SISC Secretariat at segreteria@sisclima.it by June 22nd, 2018. The 2018 edition of the Best Climate Solutions Award focuses on the challenge of “Communicating Climate Change Threats and Opportunities” and invites individuals, teams or organizations to propose innovative ideas, projects, and tools to effectively communicate climate change. Although the reality of the changing climate is acknowledged, communicating solutions or strategies to act and address its cause and impacts remains a difficult task. However, new technologies and social innovation trends open the door to unprecedented opportunities to improve the way of presenting climate change information and the actions required to fight it. Applications can be submitted via the online application form on the Best Climate Solutions platform by June 28, 2018 (5.00 pm CEST). Submitted projects will be evaluated by a highly qualified international jury and voted on through online polls. Detailed information on eligibility, evaluation process, and the prize are available in the Award section of the Best Climate Solutions website. Best Climate Solutions is a web platform developed by the Euro-Mediterranean Center on Climate Change (CMCC) for showcasing the most innovative and compelling efforts from around the world to build a climate-smart and resilient future. Through an annual Call for Proposals, Best Climate Solutions selects and awards innovative projects and actionable ideas from across the world which provide solutions to targeted climate change challenges. Seminar: Is EU on the way to meet its Paris commitments? And why not? Presenter: Barbara Stenni, Associate professor of Geochemistry, Department of Environmental Sciences, Informatics and Statistics, Ca’ Foscari University of Venice. The IPCC FOCAL POINT for Italy is glad to inform you that the IPCC has just opened TWO REGISTRATIONS for EXPERT REVIEW. Deadline: The Expert Review of the First Order Draft of the Intergovernmental Panel on Climate Change (IPCC) Special Report on the Ocean and Cryosphere in a Changing Climate (SROCC) will take place from 4 May until 29 June 2018. Expert Reviewers can register up to a week before the end of the review period. Ca’ Foscari University of Venice and the Euro-Mediterranean Center on Climate Change (CMCC) have launched a new master of research in Climate Change Science and Management targeted at international students with experience or interest in dealing with scientific and socioeconomic aspects of the urgent global challenges posed by global warming. The programme builds on the 10-year unique experience of the PhD in Science and Management of Climate Change, pioneerd by Ca’ Foscari and CMCC in collaboration with Istituto Nazionale di Oceanografia e Geofisica Sperimentale (OGS). “The integration with the well-established PhD programme and the interdisciplinary approach of the Master offer students the opportunity to navigate in just one year the complexity of climate change, getting to learn the up-to-date scientific knowledge and some of the most important tools for policy analysis“, said Carlo Carraro, Director of the PhD programme. students can conduct their internship. The application deadline for the Programme is July 15th, 2018. For more information, contact Ca’ Foscari Challenge School at master.challengeschool@unive.it or see the full presentation here.